The bright star Capella shines in the East tonight. By 7:30, it will be 15 degrees up – the end of a fist held out lengthways at the end of your arm marks about how high Capella will be 2 hours after sunset. Capella is the 3rd brightest star in the northern sky and the 6th brightest star of all (not counting the Sun!) When she’s low in the sky, Capella can exhibit a remarkable effect, flashing many different colours, from white to blue the red. This happens as the star’s light travels through Earth’s atmosphere. Any star can twinkle as the air its light travels through shifts and changes. But a star low on the horizon can also appear to change colour just as the Sun does when it sets. 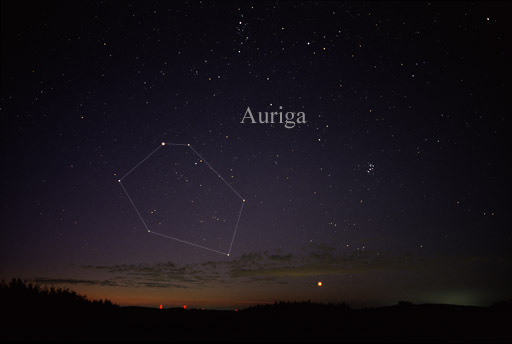 Capella is the brightest star in the constellation Auriga the Charioteer. This constellation looks like a giant pentagon or upside down cupcake, the rest of which will become more easily visible after 9 pm tonight. Capella in the constellation Auriga. Credit: Wikipedia CC. Capella’s name means she-goat. Look carefully and you’ll see her kids, three stars forming a tiny triangle directly east of the star. It is one of the few stars that keeps a Latinized name – most are called by their Arabic translations. But a star this bright has had many names throughout history. In India, the star was seen as the heart of Brahma, Brahma Hidaya and in ancient Peru, Capella was seen as a shepherd star called Colca. The ancient Mayans aligned windows towards Capella and other bright stars.